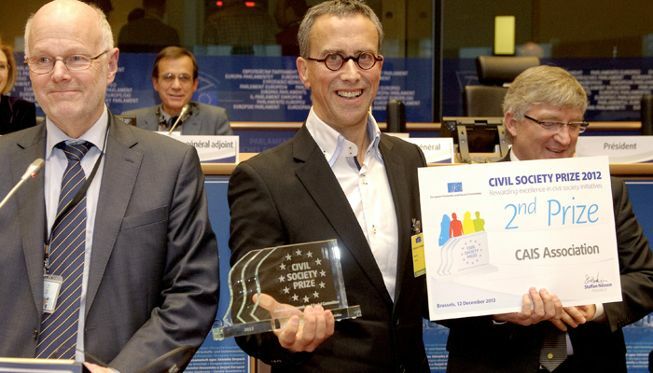 The CAIS Association, the organisation behind Portuguese street paper CAIS, won the second place in the Civil Society Prize 2012 for their work to help the unemployed, homeless and people in extreme poverty in Portugal at financially challenging times. Under the 2012’s theme “Innovate for a sustainable Europe”, the European Economic and Social Committee (EESC) called for original initiatives that specially promote sustainable lifestyles or generate green jobs in Europe. CAIS has been awarded for five projects that provided self-sustainable solutions to socially marginalised people by offering them training and work that is environmentally friendly. CAIS is a monthly street magazine sold by homeless or jobless people on the street, creating an immediate and legitimate income to the vendors through face-to-face transaction. Recycling workshop in Porto turns industrial residue or waste into useful products. Homeless people or long-unemployed people gain an income from the sales of recycled products. Dry car washing has lifted 27 people from homelessness or extreme poverty by training them to carry out an environmentally friendly car washing service with soft cloth, wax products and a vacuum cleaner and no even a splash of water. Traditional shoe polishing/waxing aims to bring back the dignity to the traditional profession by refreshing its image and give old and new shoe polishers a way to speak with one voice. The CAIS Buy@Work scheme targets large company offices such as Merck in Lisbon. Office workers can get small endless daily tasks – like dropping off a jacket at the dry cleaner’s- done by simply calling up a member employed by the scheme stationed within the company. CAIS is encouraging other companies join the scheme to increase the demand for service and get more employees on the scheme. The award money will be used to set up new programmes and support the existing ones.